Our clients know that Reitmeier takes sustainability seriously. Our goal is to reduce our carbon footprint, and this commitment is engineered into everything we do (including our core values). One of these values, Create the Right Solution, involves the continuous innovation and improvement of our operations – which is why we decided to evolve one critical element of our business: our vehicle fleet. It’s no secret that automobiles pose a threat to our global ecosystem. Inefficient cars and carbon dioxide-emitting trucks contribute daily to global warming – and as an HVAC Contractor, we sought to find a delicate balance between maximizing efficiency while meeting our capacity needs. When we began our search, we considered a lot more than just miles per gallon – we made a substantial effort to find the most efficient and best-fit vehicles possible. After researching American manufacturers, we were quickly impressed with Ford’s utilization of recycled materials – and the company’s innovative, sustainable manufacturing. It was clear that choosing Ford would contribute to our ultimate goal: to be stewards of our environment and pass the savings on to our clients. Through diligent research and investment, we developed a brand new blueprint for an environmentally friendly fleet. We had to get creative to find ways to reduce our high fuel usage, since transporting the extensive inventory and diagnostic tools necessary to complete our work requires maximum payload. Luckily our new vehicles reach up to 32 MPG on highways and 23 in the city – and our 2015 Ford F150 earned the highest EPA-estimated fuel economy ratings amongst light-duty pickup trucks. In other words, when we’re transporting our equipment to our clients, we’ll keep our carbon dioxide emissions to a minimum. Reitmeier will also have a lighter impact – literally – due to the innovative build of our fleet’s frames. Our 2015 Ford Transit Cutaway is built with an all-aluminum service body that weighs 50% less than a typical steel body – we can expect to see 9-10% in additional fuel savings from this factor alone. And because it’s made with aluminum, it is 100% recyclable. This helps our vehicles last longer and reduces life-cycle costs. It’s what’s inside that counts – especially when our interiors are comprised of recycled components. The carpet in our 2015 Ford Escape is made from 100% recycled post-consumer and post-industrial yarn and water bottles, and the seat fabric across all vehicles is made with anywhere from 25% – 100% recycled materials. Also, more than ten pounds of recovered cotton from clothing and other items are used to create sound-absorption material throughout the vehicle. The entire fleet will be equipped with the smart technology of Ford Crew Chief Telematics, which tracks service and fuel efficiency. Receiving real-time information about the health of our vehicles will help us to ensure maximum efficiency and safety for years to come. Real-time GPS tracking allows us to get the closest Technician routed to your location quickly. Our driver scorecards track driving behavior and identify improvement opportunities. Additional features include air bag deployment and a back-up camera for an even greater level of safety. We take pride in our work and culture and wanted our Fleet to be yet another example of us living our core values. We’re excited to roll out these new vehicles with our modern logo and design – and we won’t be surprised to cause a few heads to turn as we drive by. But don’t worry – this is just an outward expression of what we have always felt internally. Thank you to all our clients who keep us on the road, and who help us to make the world a healthier place – one HVAC system at a time. 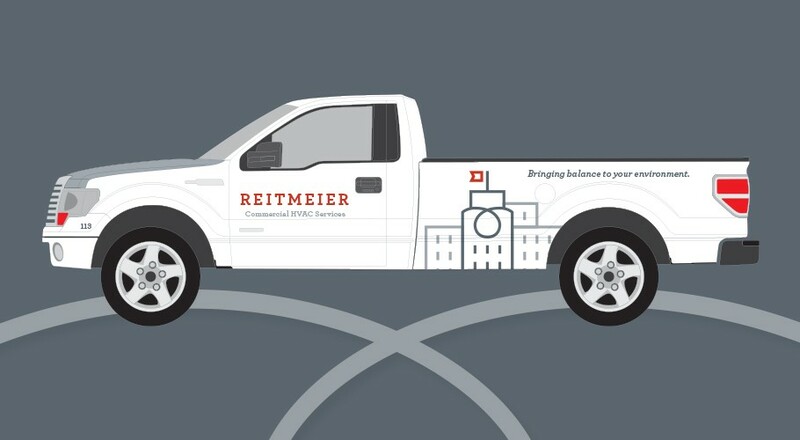 Could you use Reitmeier’s services? Call us today, and you’ll get to see one of these shiny (and earth-friendly) new vehicles for yourself. 503-603-0205.